Santa Monica Open Streets, Lower L.A. River bike ride, Metro board meeting, Metro construction updates and much more this week. Ongoing through Saturday 9/30 – This is the final week to catch photographs from Edward Solis’ series: ‘Car Free in a Car Culture’ and ‘Through the Eyes of a Bus Rider’ at the Burbank Central Library, 110 N. Glenoaks Boulevard in Burbank. The library is open Monday through Saturday; the exhibit runs through September 30. Tuesday 9/26 – The California Public Utilities Commission (CPUC) is hosting a public input meeting on Transportation Electrification. CPUC is looking for input on how the state can increase the use of electricity for personal vehicles, transit, trucking, and more. The meeting takes place at 6 p.m. at the Mexican American Legal Defense and Educational Fund at 634 S Spring Street, Suite 1100, in downtown Los Angeles. Tuesday 9/26 – The L.A. County Bicycle Coalition hosts a Handlebar Happy Hour from 5:30-7:30 p.m. at Pure Cycles at 713 N. Victory Boulevard in Burbank. Details at Facebook event. Tuesday 9/26 – Metro hosts a Westside Purple Line Construction Community Meeting from 6-7:30 p.m. at the La Brea Tar Pits at 5801 Wilshire Boulevard in Miracle Mile. The meeting will take place outside, just left of the museum entrance. Learn more about and give input on the project and current construction activities. Details at Facebook event. Wednesday 9/27 – The L.A. City Council Transportation Committee will meet starting at 1 p.m. at City Hall room 1010, at 200 N. Spring Street (public entrance on Main Street) in downtown L.A. The agenda includes DASH, Metro Call for Projects, and more. Wednesday 9/27 – Metro hosts a Crenshaw/LAX Construction Update Community Meeting from 6-7:30 p.m. at 5426 Crenshaw Boulevard in South Los Angeles. Learn about construction milestones, Metro’s Project Labor Agreement, Metro’s Business Interruption Fund, and more. Details at Facebook event. Thursday 9/28 – The Metro board of directors will host its monthly meeting where they decide agency matters. This month’s meeting will include discussion of several Metrolink rail stations, and plenty more. The meeting takes place starting at 9 a.m. at the third floor boardroom at One Gateway Plaza (behind Union Station) in downtown Los Angeles. Agenda at Metro meeting website. Thursday 9/28 – Metro hosts a Westside Purple Line Section 2: Pre-Construction Community Meeting from 6-7:30 p.m. at Conference Room A on Concourse level D at the Century Plaza Towers at 2049 Century Park E. in Century City. The meeting will feature updates on the project overview, schedule, construction activities, and more. Details at Facebook event. Saturday 9/30 – The L.A. County Bicycle Coalition hosts a Lower L.A. River Ride. The short family-paced bike ride starts at 9:30 a.m. at Spane Park at 7020 Rosecrans Avenue in Paramount, and concludes with a public input session on proposed lower river revitalization. Details at Facebook event. Saturday 9/30 – The Ride On! Bike Shop and Co-op hosts its monthly community ride leaving from 4319 Degnan Boulevard in Leimert Park at 10 a.m. The ride is family-oriented and will take participants on a 6 to 8-mile route through the community. Details at Facebook event. Saturday 9/30 – Attend a panel discussion and Q+A with the teen girls journalists and photographers from Las Fotos Project reporting on gentrification in Boyle Heights and South L.A. They will discuss their feelings about the topic, what they learned by documenting gentrification, and the power of advocacy through their reporting. This event is part of City Rising and is free and open to the public. The event runs from 7 to 9 p.m. at 2658 Pasadena Avenue in Lincoln Heights. Details at Facebook event. 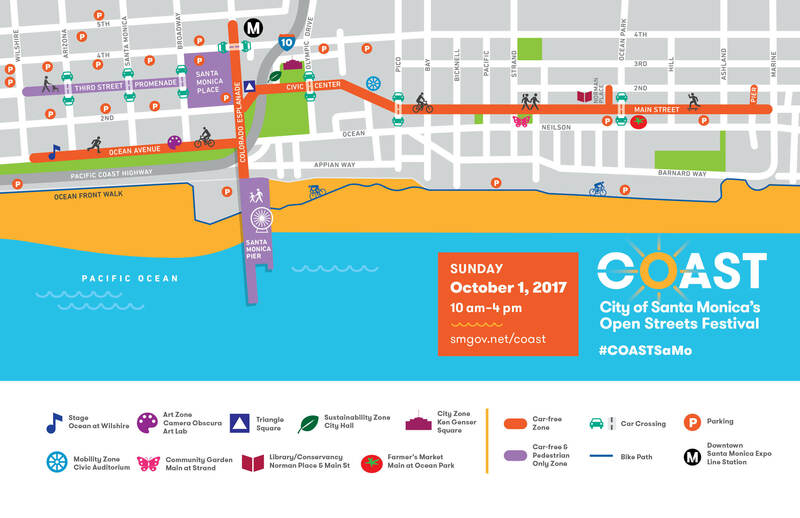 Sunday 10/1 – The city of Santa Monica hosts its second iteration of the “Coast” open streets festival. The free family-friendly event features two miles of car-free streets from 10 a.m. to 4 p.m. There are also music, art, farmers market, and much much more. Easy access via the Metro Expo Line, Expo bike path and beach bike trail. For details see the Santa Monica Coast website.